Have you ever wonder what are the best social media tools for startups? I bet you do. Being in several startups myself, I totally understand that cost is always an issue. And apart from the constantly increasing cost, the features of the tools also matter because it will either save you a lot of time or simply waste a lot of times trying to figure out how the tools work. I hope you find this post useful and let’s start with it! I find Hootsuite an interesting social media tool for startups because it is powerful and comes with a lot of features. 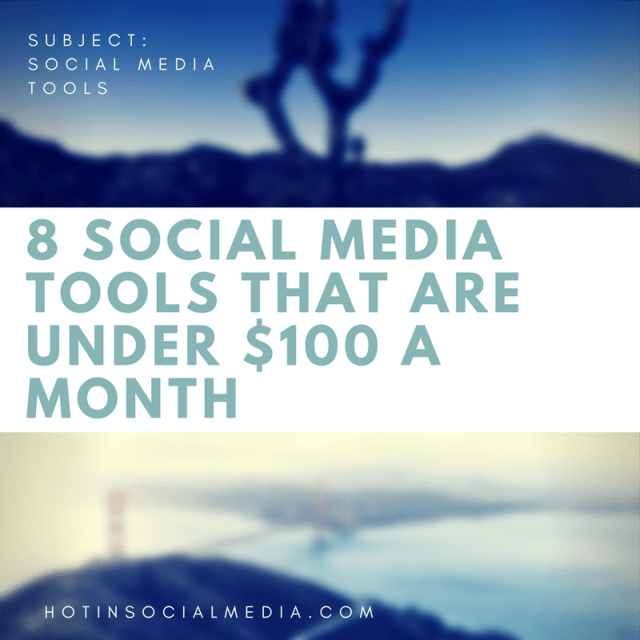 The price is also very affordable since you can start one at $10 per month, which gives you control up to 10 social media accounts under one roof. Buffer is a great Hootsuite alternative because it is dead simple to use. Buffer doesn’t come with features as what Hootsuite or most social media tools are offering, but Buffer is certainly one of the most effective tools you should be using if you want to skyrocket your social media results. Buffer may be a small country but it has over 3 million users using it on a daily basis. What makes Buffer unique is the ability to integrate Pinterest into your overall marketing strategy. Integration of Pinterest certainly gives you an edge, especially in visual marketing. Don’t forget that Buffer comes with Pablo which you can easily create images directly on Buffer. The best part about Buffer is that the lowest plan starts at $10 for up to 10 social media accounts. Very affordable with so many features? A winner for sure! AgoraPulse is a great and new tool that I had used recently. Not, let’s put aside that I’m using it. What you need to know about AgoraPulse is that it is really advanced and is great if you are looking for a social media tool that does more than the average ones. What does AgoraPulse does best? AgoraPulse is not your average social media tool. It is a tool that will transform your startup into a massive competitor in the social media world if you have the right strategy. And believe it, AgoraPulse is that powerful! AgoraPulse starts at $49 per month and is well below the $100 range. I use Meet Edgar when it was just in beta mode and let me tell you this. It is fun and easy to use, and it is really powerful! Users can create their own library and each library can be tagged accordingly. For example, I can set ‘daily library’ for daily posting while ‘one off library’ for sharing only once. Meet Edgar is used by social media influencers such as Socially Sorted and ProBlogger. Such features would allow any startup owners to plan their marketing strategy effectively with very less cost. If you are interested in using Meet Edgar, it starts at $79 per month. Is your Facebook marketing not getting the response you need? Chances are you need Post Planner to boost the engagement. What is Post Planner? Post Planner is a tool that helps you increase engagement level on Facebook (and Twitter). There is much content that you can choose from the library such as questions, trivia, images and quotes. Typically, a human is very attracted to the specific type of content. Using Post Planner, you will easily increase your engagement level on social media effectively and with a very low cost. At this point of time, Post Planner costs $9 per month. One of my top favorite social media automation tool. Socialoomph is not your average social media tool. What it does it allowing you to connect to unlimited social media platforms (yes, unlimited) while allowing you to schedule content on automation. Now, this is where it goes really crazy. You can use spinning technology to make your content unique, even when you are repeatedly using the same post. This ensures that social media platforms will not penalize you for constantly using the same content over and over again. How much does Socialoomph cost? The lowest plan starts at $6.97 once every two weeks. Most startup owners are great business persons, but how many of them actually have good designing skills? Don’t worry, I am not good in designing either! With Canva, I could easily create powerful images that attract people instantly. The best part? Canva is free and comes with multiple designs that I can use to create mesmerizing images for my blog, website and much more! If you ever need to purchase an image, consider buying from Canva at $1 per element or image. Very affordable indeed! Photo editor. Design maker. Idea realizer. Yes, you got that right! With PicMonkey, you can easily edit photos, create or design your own images and the only thing that lies between you and success is your idea. There is nothing that PicMonkey cannot do and if you want to take visual marketing to a whole new level, consider using PicMonkey and I am sure you will be amazed, to say the very least! Do you have any social media tools you would like to share with the readers here? Leave a comment and I’ll try to feature them for future posts!